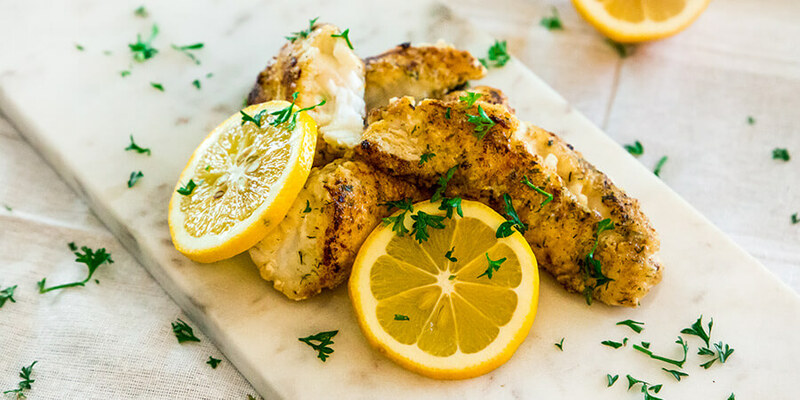 I guarantee this pan-fried lemon fish will be the best you’ve ever tried! Every now and again you make something so good you just have to share it. 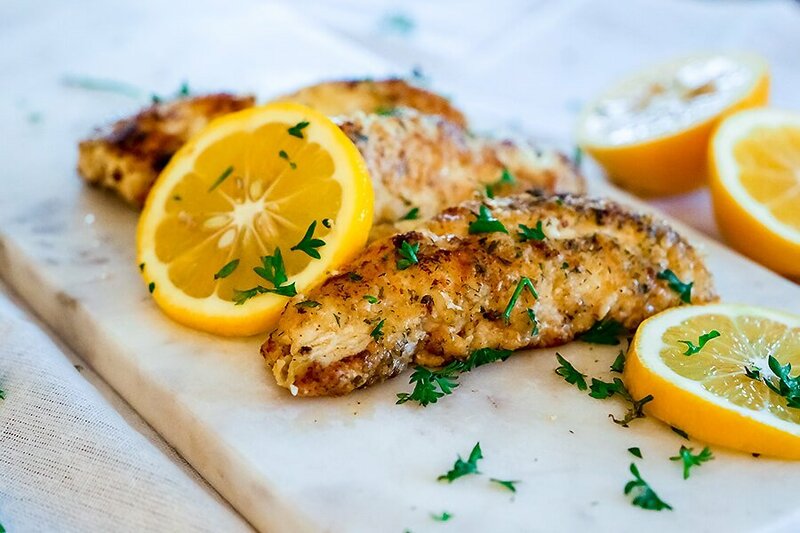 This fish has a lovely golden crust with a zingy lemon flavor which you just can’t beat on a nice piece of fresh fish. It packs a punch and has loads of flavor! 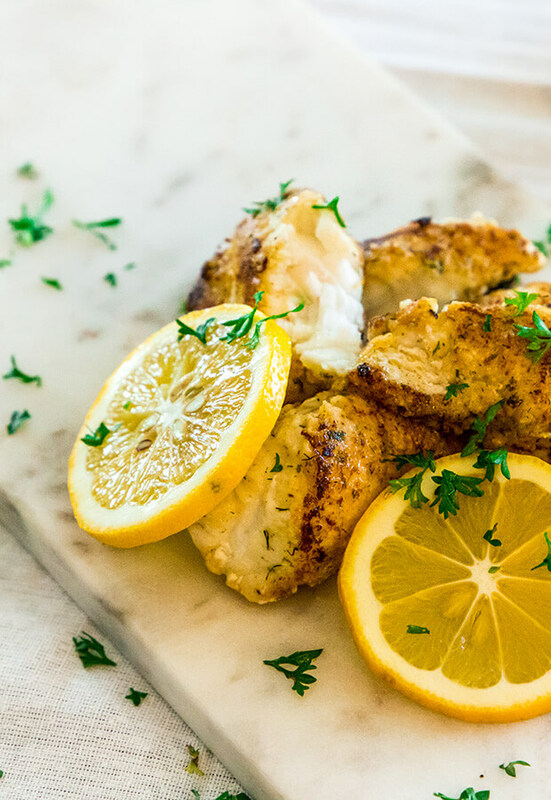 Try this recipe with any type of fish. 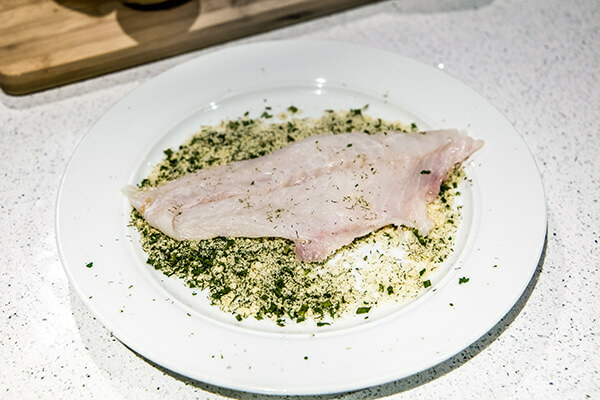 I have used Gurnard for this recipe but you can use just about any piece of fresh sea fish you have available. You may have to adjust cooking times to suit. To check whether fish is cooked, place the ends of your fork into the smallest part of the fish at the end, and attempt to lift and twist. If the fish resists flaking continue cooking until it flakes apart. Be careful not to overcook your fish though. There really is nothing worse. Fresh lemon is always best but this fish tastes just a delicious with the bottled juice, if this is all you have available. The same goes for the herbs. I came home late at night and made this so I used dried herbs, but fresh herbs would be amazing too if you have them! 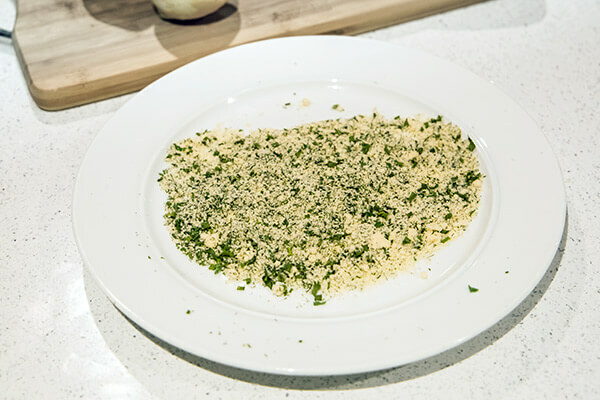 Experiment with different herbs like parsley and try using some lemon zest in the almond flour. These combinations also work very well. It’s simple, easy, has loads of flavor and takes less than 15 minutes to get to the table. Can you really think of anything else you would rather be cooking? I can’t! Cook some greens and it’s a healthy keto friendly dinner. Drizzle any remaining butter and lemon over your greens. To lift the fat content of this meal, I sometimes serve this with a lemon buerre blanc sauce. If you love your seafood and have fresh fish available I recommend you make this next on your list of things to try. I guarantee you will convert any no keto, breadcrumb loving, friends to this recipe if you invite them over for dinner and try this out. 1. On a large dinner plate mix together the almond flour, dill, chives, onion powder, garlic powder, salt, and pepper then spread evenly. 2. Take the fresh fish fillets, one at a time, and press into the flour mix. Turn and repeat. You want to really cover them well and place on a separate plate once done. You can do this in advance and hold in the fridge until cooking. 3. In a large pan, heat half the butter and half the lemon juice over a medium-high heat. You want it hot enough to crust the flour mix but we don’t want to burn the butter or turn the juice bitter. 4. Let the fish cook for approximately 3 minutes. Give the pan a wriggle so the fish soaks up all the lemony butter. Don’t let your pan dry out. Add more butter or lemon juice if necessary. 5. Place the other half of the butter and remaining lemon juice into the pan and flip the fish to cook for another 3 minutes. Again, give the pan and fish a bit of a swirl around. The coating should be nice and golden brown and you should be able to see the fish cooking through. 6. 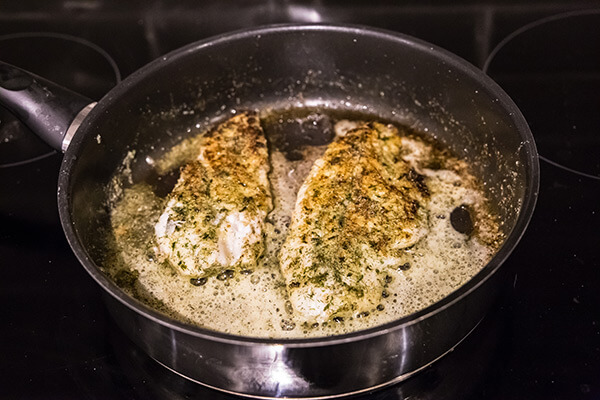 Check if the fish is done with a fork and remove from the pan when almost done. The fish will continue to cook so we want to avoid over cooking. If you have steamed vegetables waiting pour the butter with all the crunchy bits from the coating onto your veges. It makes a lovely dressing. This makes a total of 2 servings of Zingy Lemon Fish. Each serving comes out to be 406 Calories, 30.33g Fats, 3.55g Net Carbs, and 29.07g Protein. On a large dinner plate mix together the almond flour, dill, chives, onion powder, garlic powder, salt, and pepper then spread evenly. Take the fresh fish fillets, one at a time, and press into the flour mix. Turn and repeat. You want to really cover them well and place on a separate plate once done. You can do this in advance and hold in the fridge until cooking. In a large pan, heat half the butter and half the lemon juice over a medium-high heat. You want it hot enough to crust the flour mix but we don’t want to burn the butter or turn the juice bitter. Let the fish cook for approximately 3 minutes. Give the pan a wriggle so the fish soaks up all the lemony butter. Don’t let your pan dry out. Add more butter or lemon juice if necessary. 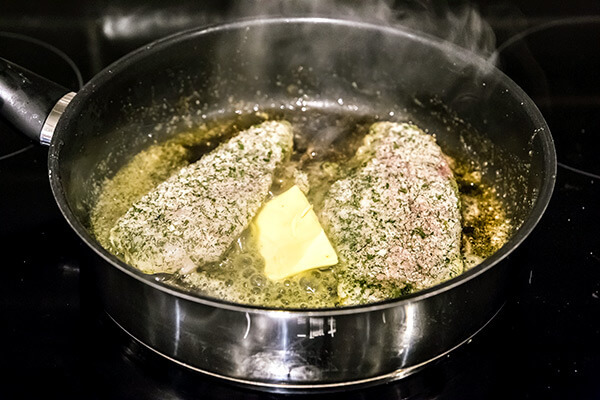 Place the other half of the butter and remaining lemon juice into the pan and flip the fish to cook for another 3 minutes. Again, give the pan and fish a bit of a swirl around. The coating should be nice and golden brown and you should be able to see the fish cooking through. 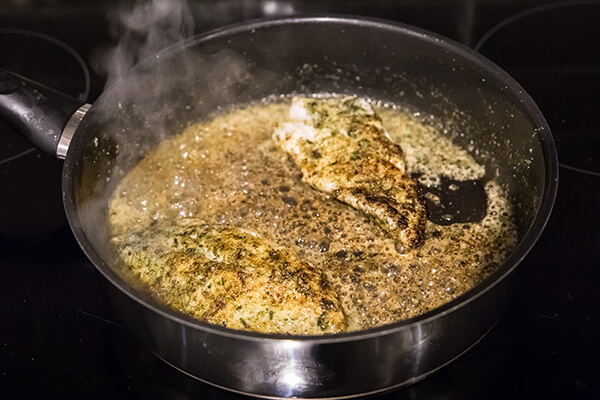 Check if the fish is done with a fork and remove from the pan when almost done. The fish will continue to cook so we want to avoid over cooking. If you have steamed vegetables waiting pour the butter with all the crunchy bits from the coating onto your veges. It makes a lovely dressing.